Both models indeed capture photos and record videos in similar resolutions. However, there are a lot more factors that come into play instead of just resolutions. 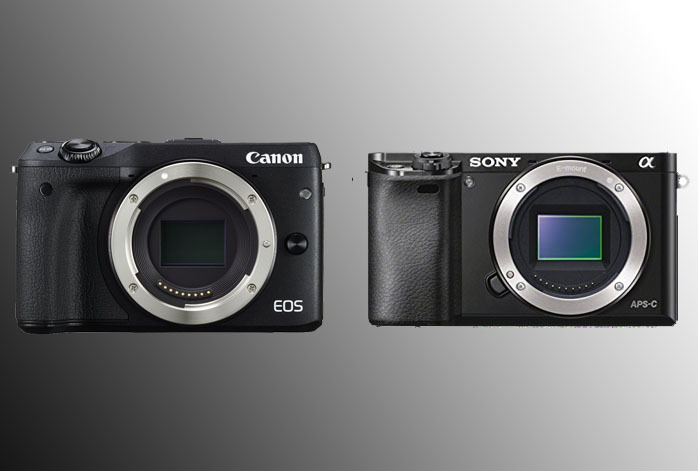 Even though the sensors of these mirrorless digital cameras are both 24MP, Sony a6000’s image sensor has slightly larger pixel area than Canon EOS M3’s. And this advantage seems to be enhanced further by sophisticated internal engines because Sony a6000 manages to deliver significantly better color depth and dynamic range than Canon EOS M3. Its colors are more accurate, solid, vibrant, and vivid. Color gradation and shadows are depicted very well. Each product has a viewfinder as well as built-in flash and external flash shoe. Both products support AE bracketing, a nifty feature for landscape and HDR photography as well as to handle difficult lighting conditions. However, Sony a6000 comes with a much wider AE bracketing range than Canon EOS M3. It can perform AE bracketing for up to plus-minus 5EV, while the contender only applies AE bracketing to plus-minus 2EV. Certainly, Sony a6000 will capture more precise colors and details than Canon EOS M3. Sony a6000 boasts 51200 maximum ISO, 179 focus points, and 11 fps photo burst. To compare, Canon EOS M3 only has 25600 max ISO, 49 focus points, and 4.2 fps photo burst. You can be sure that Canon EOS M3 is pale in comparison with Sony a6000 for sports photography. With Sony a6000, you will be able to track moving objects with the phase-based and contrast-based autofocus system. You can capture sharper and more detailed images, and the super-high continuous shooting speed ensures that you don’t miss any moment. Also, Sony a6000 has a much bigger RAW buffer capacity (22 shots) than Canon EOS M3(4 shots). Last but not least, both models are already armed with Wi-Fi wireless connectivity. Sony a6000 has a longer battery life than Canon EOS M3. In the end, Sony a6000 proves to hold various advantages over Canon EOS M3. Therefore, you should choose Sony a6000 for the best usage experience!